Best thing about Mondays? They mean only one more day until Taco Tuesday! Ever since moving to San Diego from NY/NJ a little over two years ago, tacos have become a little bit of an obsession. Thankfully, I only very rarely cheat and get traditional tacos with corn tortillas. (Although when I do decide to indulge, Tacos El Gordo is my jam). Most of the time, I experiment and make different types of paleo-friendly tacos at home. My new favorite flour to make tortillas with is cassava flour and you can find my recipe for cassava flour tortillas by checking out my Halibut Fish Tacos with Avocado Aioli recipe. 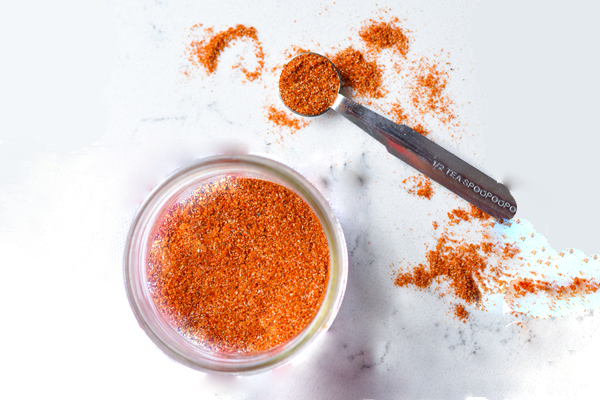 This taco seasoning is paleo-friendly and junk-free. While it might seem easier to just grab a packet of seasoning at the store, I promise you’ll be pleasantly surprised at how easy it is to make seasoning at home. Plus, next time you’re thinking of buying a packet of taco seasoning, take a look at the ingredients. If you see anything listed that doesn’t resemble a common spice, it’s probably a bad sign. Most packaged seasonings contain additives, fillers and often, MSG. While it isn’t required, ideally you’ll want to opt for some good quality, organic spices. In my opinion, the best spices out on the market right now are from Primal Palate. They are all organic, gluten-free, kosher, non-gmo and non-rriadiated. That last part is super important. Most spices are irradiated, meaning that they are much more likely to decline in nutritional value over time. Non-irradiated spices are not only more nutrient dense, they are simply far more delicious and smell a whole lot better. Primal Palate just released 7 more spices to their existing 7 including mouthwatering blends like Pumpkin Spice, Apple Pie and Cinnamon Sugar Cookie. For this recipe, you can use their oregano, garlic and sea salt. I always make extra of this mix and keep it on hand for Classic Grass-Fed Beef Taco nights! Add to your favorite taco recipe.